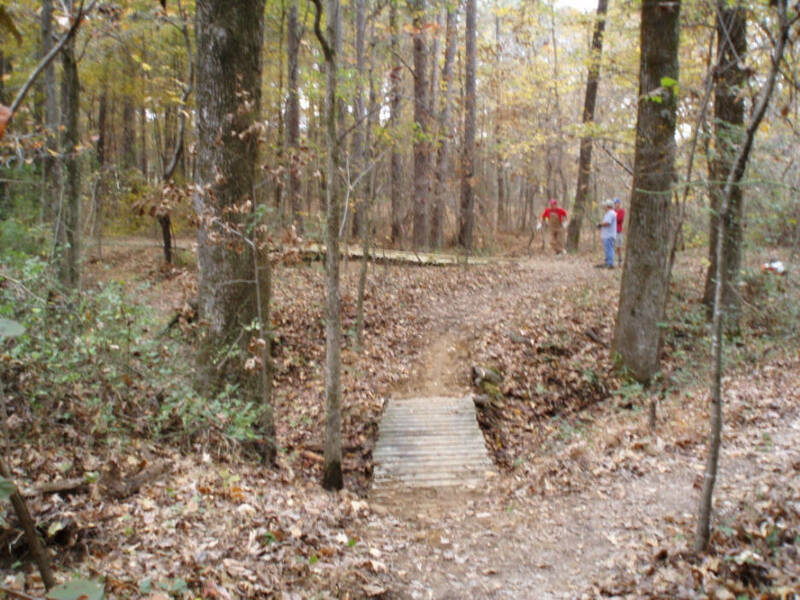 On November 8, 2009, MSTA built a new bridge over a creek that was recently taken over by a very industrious beaver. Several times the dams he built were knocked down only to be built back even higher. The small bridge that had served to get trail users over this creek for many years was washing out with every rain. MSTA discussed the matter with Lake Manager Damon Boyce who suggested a new higher bridge. Damon had a collection of used utility poles that he offered to use as a long span over the creek. We looked at the inventory and picked out two long poles in good condition. Steve K. met with Damon and his technician. The poles were loaded on a trailer to be taken to the site. 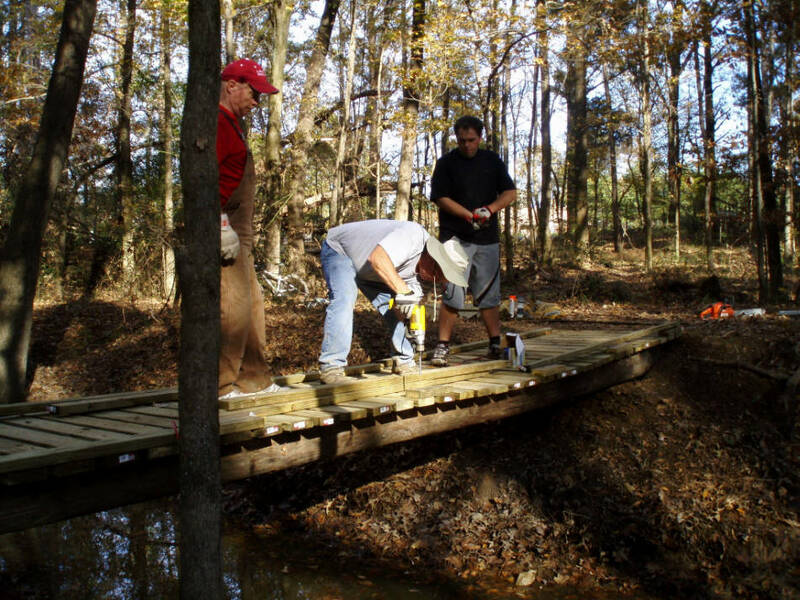 It took some time to get all the conditions right to set up a work day to build the bridge. There were races and then a period of rainy weather. Finally everything came together to build the bridge. MSTA attracted a large number of volunteers for the project which made the bridge come together in six and one half hours. We even had enough time to reuse the old bridge in a small gully on the approach to the new bridge. Below is a series of pictures showing the construction of Beaver Creek Bridge. It took all the volunteers we had to get the utility poles set in the creek bank and to build the support shown on the left side of the picture. By this time the decking is being nailed to the utility pole stringers. When we arrived on the site the first job was breaking the beaver dams to lower the water level. The location where the generator is setting was under water when we arrived. Here is another picture of installing the bridge deck. John H. brought his compressor and nail gun which finished that section in a short time. 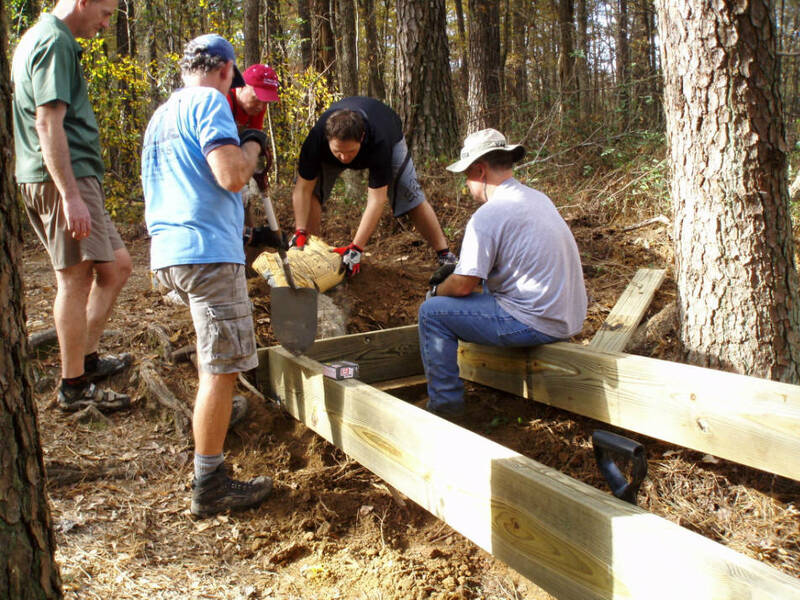 Here is a picture of John reloading his nail gun while other volunteers position the deck boards. Here is a the footer and stringers for the west end of the bridge being set. Here we are getting ready to deck the section from the support to the west end of the bridge. The beaver dam was cut again which lowered the water level in the creek to the level of the lake. The little guy will rebuild. Chris I. 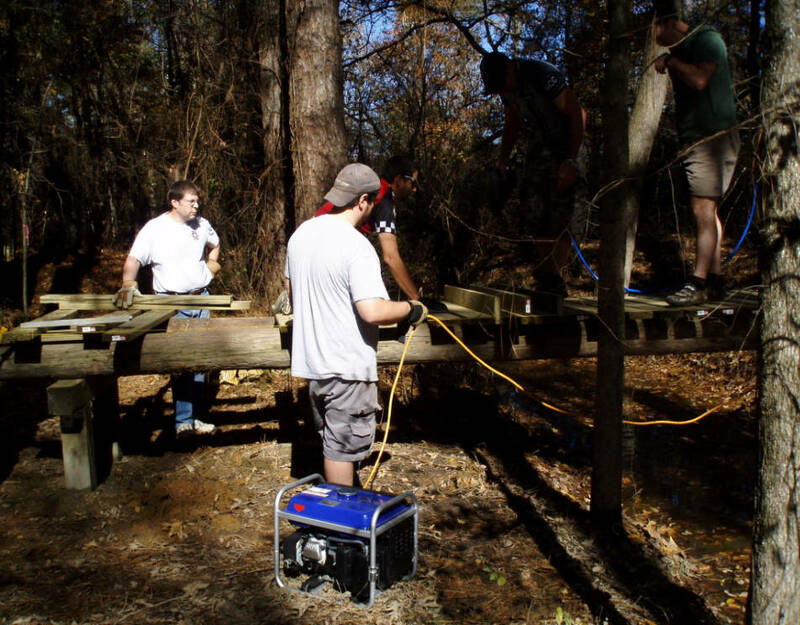 (with Drill) is attaching the last of the deck boards on the bridge. 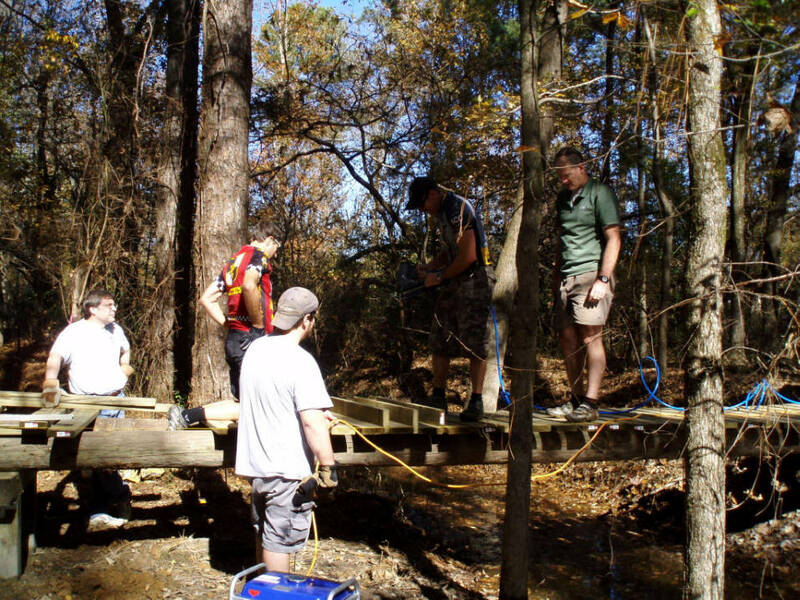 MSTA met with Damon before building the bridge who said it did not need a railing. 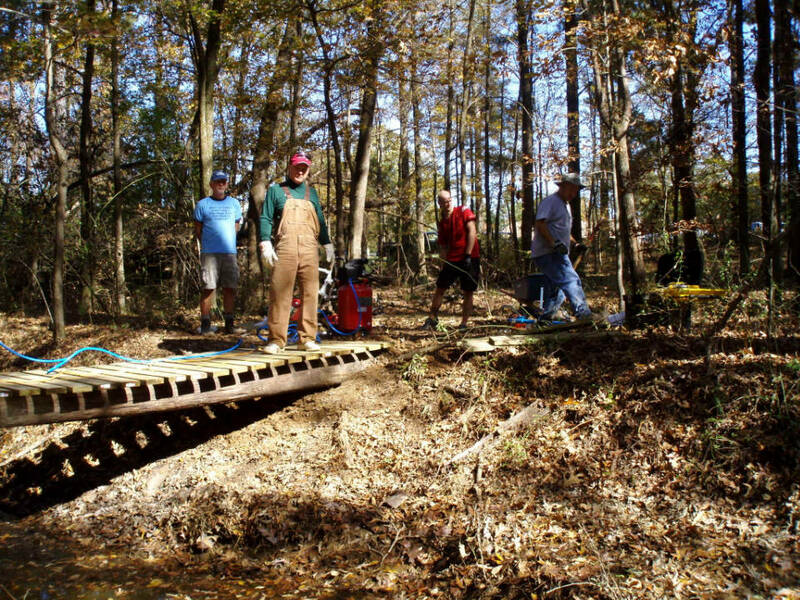 MSTA decided to use guidelines established by the U. S. Forest Service for bridges and include a curb structure. Here the curb and support blocks are being laid out. Joe C. attaching the curb to the bridge deck. 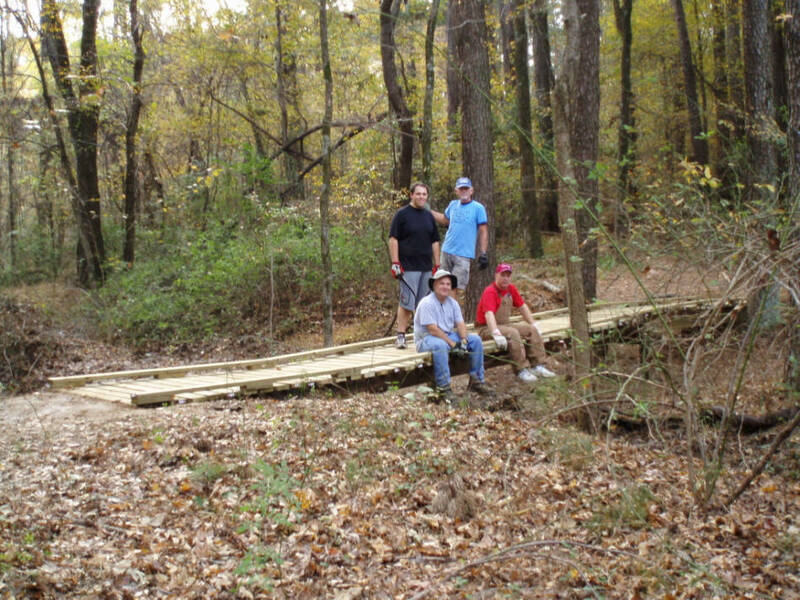 Here are some of the volunteers who were able to stay for the entire day relaxing on the completed bridge. 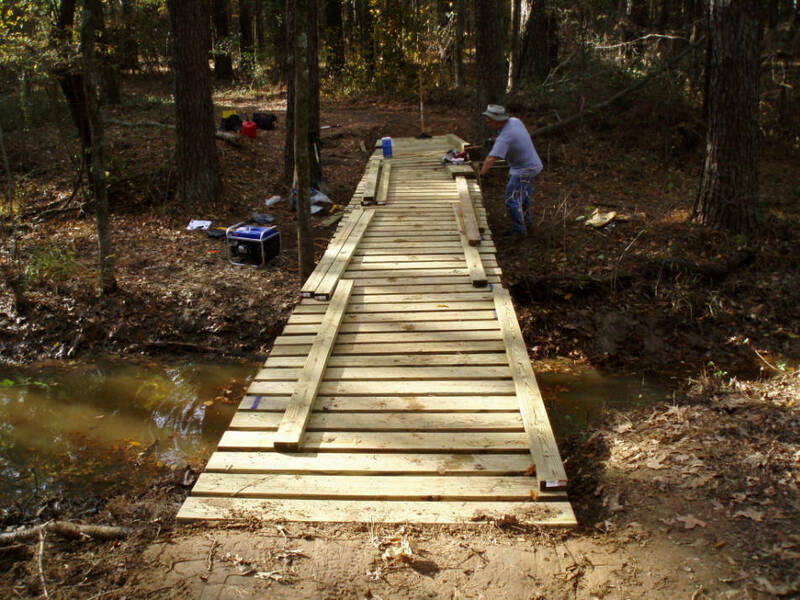 The completed bridge measures 39 feet 7 inches, so we will call it 40 feet. Here is the old bridge reused in a gully on the approach to the area. 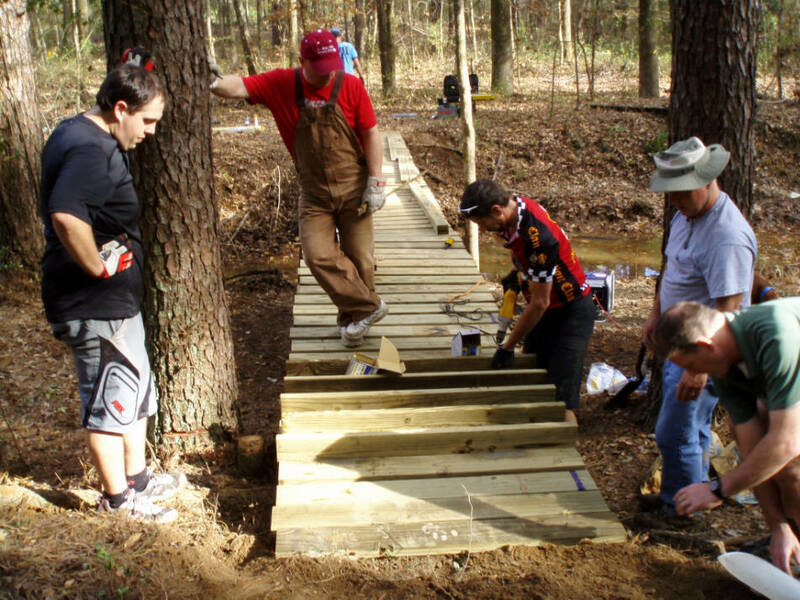 We were originally planning to move this bridge to another place on the trail system. That is until we found out how heavy it is. Then a new plan formed. Use it right here! So we did.